Australia Day. Not all of you will be celebrating. But in honour of the day I thought I had best post my favourite coconut recipe. I don’t know wny I always think of dessicated coconute when it comes to cooking Australian treats, but there you go. Lamingtons, Anzac biscuits. The list is not quite endless but my mind can only concentrate on those two delicious things. And now here’s a third. I have adapted this recipe from a very strange source – a Nigella Lawson cookbook. She called them breakfast bars and the main ingredient would suit breakfast nicely. Rolled oats. They have become the cycle bar of choice for family and friends who will insist on going on long, strenuous bike rides. So now instead of having to write out the ingredients for cyclists from The London Phoenix Cycle Club, you can just click. You can make up the dry ingredients ahead of time; make a few batches. You can freeze the bars as well as storing them in Tupperware containers. The almonds should be bought as whole nuts and then chopped to a size that is small enough not to stick in your teeth when you are cycling, but not completely ground to dust. Make sure you get sweetened condensed milk and not just condensed milk. 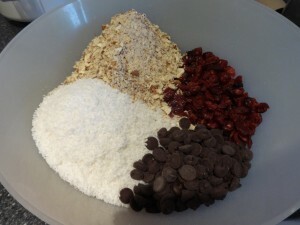 You will need to heat it slightly so the dry mix combines. But not too hot as it will melt the chocolate chips. The easiest way (and it saves you on washing up) is just to put the unopened can in a slightly bigger bowl and pour over very hot water. Leave it for five minutes while you assemble the dry ingredients. Choose a baking tray that is not too deep. Around 1 to 2cm high will do. Don’t use aluminium to line it as it will stick to the bars. I use baking paper. In a bowl combine all the dry ingredients. Drizzle over the honey. Once the condensed milk has warmed up, open and then pour over the ingredients. Stir well to combine. Line a baking tray with some baking paper. Press the mixture into a baking tray (wet your hands to stop them sticking). Press quite firmly. Cook in a low oven of no more than 130C for 45 minutes. Check and if the top is not golden, cook for just five minutes more. Remove and allow to cool before cutting into thick squares.